Set during the Civil War and following years, Louisa May Alcott’s Little Women tells the story of four remarkable sisters: Meg, Jo, Beth and Amy. When we first meet them, they, and their mother, struggle to make ends meet while their father serves as a minster in the Union army. Despite their lack of material wealth, the Marches share what little they have with their poorer neighbors. This charitable act catches the eye of their wealthy neighbor James Laurence and his grandson, Laurie. Over the course of the novel, Laurie grows close to the sisters, particularly Jo. In writing Little Women, Alcott drew heavily from her childhood in Concord, Massachusetts, the book’s principal setting. Like the Marches, the Alcott family struggled financially at times. The Alcott family also followed American transcendentalism or the belief that people and nature are inherently good. On numerous occasions, Alcott’s characters express a belief in transcendentalism. Even when they’re at their lowest, they choose to see the good in others. Additionally, the character of Jo is said to be drawn from Alcott. They not only shared numerous personality traits, but both chose to pursue literary careers at a time when middle class women did not work outside of the home. While Little Women takes place during the late-nineteenth century, the story continues to strike a chord with today’s readers. Like modern girls, the March sisters fall in love, encounter envy, struggle to fit in with wealthy friends, fight with siblings, and find their way in the world. We rejoice at Meg’s marriage, laugh at Jo’s antics, and weep when they lose loved ones because these are universal experiences we all go through at some point. In other words, we see ourselves in the Marches. 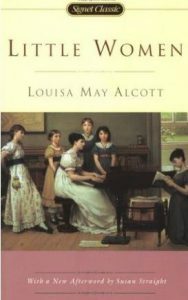 Alcott, Louisa May. Little Women. New York: Signet Classics, 2004. Originally published 1868.